Another Manning-Educational Passages collaboration involves a new sensor package on the miniboats to obtain more information about environmental conditions. Up to now they have been equipped with a GPS sensor to provide latitude and longitude so they could be tracked along their route. A new miniboat named “Rock Star,” named after a skiff owned by Manning’s son Miles, was first deployed in Woods Hole harbor. On October 13 it was launched from Corporation Beach in Dennis, Mass. into Cape Cod Bay to measure the surface temperature in the bay. 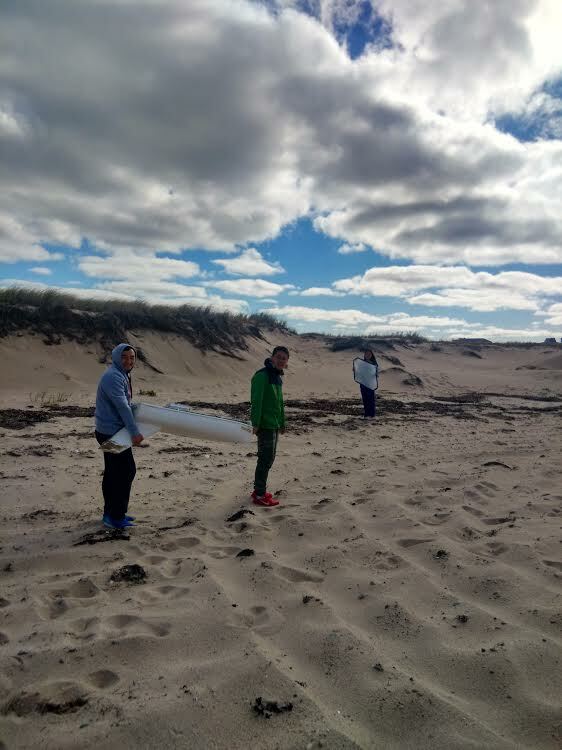 This information will be combined with the current flow data from a few dozen drifters being deployed by Cape Cod and eastern Massachusetts high schools and colleges for a turtle stranding project Manning is working on with Mass Audubon’s Wellfleet Bay Wildlife Sanctuary. While upgrades are being made to some boats, several of the miniboats have received international media attention. “West”, from Westbrook Middle School in Westbrook, Maine, was launched December 2, 2013 off Georges Bank by Bro Cote, a local lobsterman. It sailed across the ocean, surfing six-meter (roughly 20-foot) waves before crashing into rocks along the Portuguese coast on November 12, 2014. It was relaunched several more times, each with a story of its own, and came ashore on August 30 on the Isle of North Uist in the Outer Hebrides, Scotland. It currently is at a local school and supporters there are hoping to relaunch the boat. “Charger“, from the John Winthrop Middle School in Deep River, Conn, has made one of the longest and most dramatic voyages of any miniboat. First launched in June 2012, it has traveled more than 16,000 miles and visited Newfoundland, Wales, Portugal and been relaunched numerous times. It is awaiting a trip home from Georgetown, Guyana, where it landed in December 2014 after nearly completing the Atlantic Circle. With a dead battery and GPS unit, “Charger” cannot be relaunched. Its recovery has been on hold as supporters seek assistance to get it home from Guyana and back to the students at John Winthrop Middle School, who plan to repair and relaunch it so it can continue its journey. NOAA Fisheries Service is dedicated to protecting and preserving our nation’s living marine resources and their habitat through scientific research, management and enforcement. NOAA Fisheries Service provides effective stewardship of these resources for the benefit of the nation, supporting coastal communities that depend upon them, and helping to provide safe and healthy seafood to consumers and recreational opportunities for the American public. Join us on Facebook, Twitter and our other social media channels.